When it comes to flowering trees, these two hold a special place in our yards and our hearts. Dogwoods may be small in stature, but they deliver big on blooms. North Carolina’s quintessential herald of spring — blossoming just after the early daffodils and just before the tulips — sprinkles landscapes from Murphy to Manteo with flowers that nearly twinkle. Big ol’ bushy-headed bloomers that range from white to hot pink and almost to purple or burgundy, crape myrtles provide riotous color that lasts the entire summer. Where would our office parks, interstates, and yards be without their cheerful blossoms? Originally, crape myrtles came from parts of Asia and Oceania — but we’ve adopted them as our own. In 1548, these trees became known as “dogtree,” derived from “dagwood,” because the wood was so dense — tough enough to make daggers and arrows. A big thanks to Dr. Donald Egolf of the U.S. National Arboretum, who used seeds from Japan to breed more than 20 mildew-resistant varieties able to thrive in our humid Southern climate. To our sorrow, dogwoods can “up and die.” There are some nasty diseases out there. To keep your tree happy, plant it in full sun and water it well. Because they’re native to woodsy environments with lots of leaf litter, keep grass off the roots. Stop chopping those branches! “If you wanted your children to be shorter, would you cut off their heads?” crape expert Tony Avent jokes. The only pruning a crape myrtle needs is removal of those pesky water sprouts on the trunk’s base. A beloved tale holds that the four-petal flower, which often blooms around Easter, symbolizes the cross that Jesus was crucified on, with a thorny crown at the center. Crape myrtle blooms seem to beg for a vase, like a low-maintenance hydrangea head. But they don’t like being indoors, so watch out: They’ll drop petals all over your table. 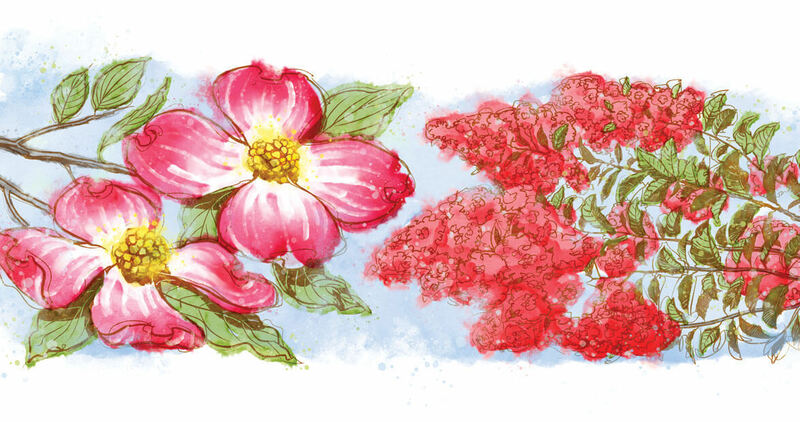 According to Ranney, in terms of ornamental merit, the dogwood is “the standard flowering tree by which all other flowering trees are judged.” That’s why it was chosen as North Carolina’s state flower (not tree). These trees are more than just a pretty face: Bring on the drought and the heat, because crape myrtles are summer survivors. Tom Ranney has been studying dogwoods for 25 years and is a distinguished professor of horticultural science at North Carolina State University. Tony Avent, owner of Plant Delights Nursery in Raleigh, has made more than 85 plant research expeditions around the world.